My brain has never been more exhausted. And my heart has never been more full. I spent a week as part of the Taizé Community this summer. It’s an ecumenical community in southeastern France, established during World War II to promote peace and reconciliation. The community has welcomed young adults for much of its history, and currently hosts up to 5,000 young people each week. They come from all of the different European countries, and from the US and other countries across the globe. They stay in simple dormitories or tents, eat meager vegetarian meals, study the Bible together in small groups, and attend prayer services three times each day, sometimes staying in the church ’til midnight or later, singing the songs of Taizé. The brilliance of these gatherings is that people are coming with a multitude of different languages. Many speak French or German, in addition to their native tongue, and some speak 4 or even 5 languages, because of the variety of cultures scattered throughout their home country. The brothers of Taizé lead a Bible teaching session each morning, in English. And each language group gathers together around one of their own, the person nominated to be translator for the day. For small group discussion, participants can choose a group of people who speak their own language or branch out to an English-speaking group where there might be more variety in backgrounds. As an English-only speaker (more about that embarrassment later) I was blessed to be in a group with people from the Czech Republic, the Netherlands, and Switzerland. I learned to speak slower so that I could be understood, and to have more patience during discussions so that others would have time to formulate their response in their head, and then translate it into English to be spoken. I learned so much: how faith has guided a new generation in the Czech Republic as they knit their country back together after two generations of communist oppression. I have a new respect for the internal conflict of someone who lives and banks in Switzerland among powerful institutions that are at the center of worldwide greed. I grew in my respect for small nations like the Netherlands and the way they care for the least of their citizens, and how they’re inspiring the next generation to lead. The cacophony didn’t just stop at dinner time, though. The multitude of languages is at the heart of worship for Taizé. 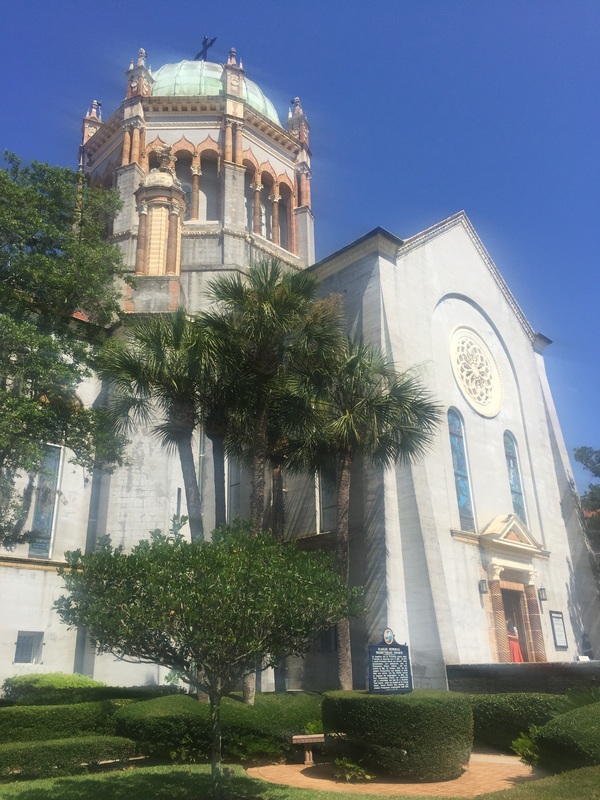 At Morning Prayer, Mid-day Prayer, and Evening Prayer, the services were filled with songs in multiple languages: French, German, Spanish, Polish, Latin, Czech, Italian, English. The short Scripture reading was done first in French, then in English, and then in a cascade of different languages at each service. The spoken prayers were always given in multiple languages, too, and as the week unfolded, I discovered that I could lose myself in the sounds of other tongues, knowing that we were all praying together. I began to memorize the songs that formed the core of our prayer services, at first just stringing syllables together, and soon enough being able to pay attention to the English translations so I would have an understanding of the different words and their meanings. I always sat next to different people for the prayer services, and so I improved my pronunciation depending on the native language of those around me. Prayer services began to represent the beauty of the entire experience of Taizé: many people from many languages joining together to seek God’s presence. We were singing Our Songs. But just as it was powerful to experience the multitude of languages, I saw firsthand the power of hearing your native tongue in worship. One of my roommates and fast friends that week was Marta from Barcelona, a city with a proud independent heritage apart from Spain, with its own language: Català. In the early part of the week, we had sung several songs in Spanish – Castellano, to be exact. But it wasn’t until we sang a song in Català that Marta felt at home. I wasn’t educated enough to know the difference between the languages, but my heart could feel the wave of emotion she was experiencing. Tears were trickling down her cheeks at the end of the service when she told me, “That was my song.” Although she had been wholeheartedly joining in the singing of all the songs during the prayer services, at that moment, she felt personally invited into the worship. It was her language. It was her heart. It was Her Song. We have a continuing conversation in the US in our Anglo churches about how to reach out to the Latino community. And somehow, we are still wondering whether, as pastors and as church leaders, we really need to learn how to speak and lead worship in Spanish. But one thing Taizé taught me is this: a multitude of languages reminds us that our differences come from God, and hearing our own language reminds us that we are each made in God’s image. Worship is both Our Song and My Song. Faith is a language of the heart. Let’s give our welcome in a language of the heart, too. What do you do when things don’t go as planned? For most of us, it’s easy to take it in stride when a new recipe turns out less than delicious, or when the weather doesn’t cooperate with our outdoor activities. But what if you’ve just traveled thousands of miles, arriving at a Christian community that specializes in stirring worship services and inspiring action for justice and peace on a holy island known for its breathtaking views and spiritual experiences – and you’re not moved at all? Going on a pilgrimage is an ancient spiritual discipline that many of us are undertaking in new ways. Traveling to Iona Abbey on my own 5 years ago, I learned first hand what it means to be a pilgrim. Making the long journey to a special place, and then living in intentional community for a week with strangers, taught me a great deal about myself and my faith and my sense of call. I was transformed by the land, by the people, by the worship. I was so moved that I returned the following year with a small group from my congregation. Sharing the pilgrimage with others deepened my experience, as we formed our own little community as we traveled, and made room for each other along the way. After completing my first year as campus pastor at TLU, I imagined the impact on students of a pilgrimage to Iona. I waded through piles of paperwork and mounds of requirements to put together a study abroad trip that would give young adults the opportunity to travel as pilgrims and open themselves to the transformation I had experienced. I shared with potential students my stories of meaningful relationships, beautiful music, and solitary walks along the rocks at the beach. I told them that the Isle of Iona has been considered a “thin place” for centuries – a place where the earth and the heavens meet and the holy is within arm’s reach. I encouraged them to apply if they were looking for a place to contemplate their life’s meaning, the bigger questions of faith and call and purpose. After meeting every other week throughout spring term, talking about what to expect, what to bring, and what was required, we set off from the airport, ready for our spiritual adventure. The journey was long. And the jet lag was harsh. With just 7 hours of “night” on the plane ride across the Atlantic, we hit the ground in Scotland at a brisk stroll. Navigating the bus into the city and construction at the train station, we found the right track, and traveled several more hours to our overnight stop, where there was still much walking to do. The next day held two ferry rides and one harrowing bus ride with a very impatient driver, plus another long walk. By the time we were settled into our rooms at Iona, our group was exhausted. Iona Pilgrimage Study Abroad class, one ferry away from Iona! And so the spiritual experience began. We were meeting new people: our roommates, our housework group-mates, and the volunteer staff who were there to support us. We were going to chapel two times a day, getting up early for the first, and staying up late for the second. We were hearing about the Iona Community’s work for justice and peace, and were encouraged to find ways to make a difference back home. We were exploring the island, finding paths that cut through fields of sheep, leading to sandy shores and craggy hills. As an experienced pilgrim, I could see that the place and the people were doing their work: planting seeds, offering new perspectives, blowing through with unexpected insights. But my group of new pilgrims, some of whom were first-time travelers, were frustrated by the end of the second day. What do you do when things don’t go as planned? Even as pilgrims, maybe especially as pilgrims, we experience disappointment. When you decide to set off on a pilgrimage, you have big expectations. You’re going to meet God in every flower and sunrise. Your whole approach to faith and life and spirituality is going to be transformed. Every day will be filled with happiness and light. Every conversation will be uplifting. But then reality hits: pilgrimage is like real life. Sometimes you wake up tired and miss the sunrise. Some days you’re just going through the motions. And occasionally you encounter people you can’t connect with. Some days are just dark, even in a holy place. What enables a pilgrimage to be transforming is letting go of expectations and allowing reality to do its work. What turns a dark day into something meaningful is allowing it to be dark, and gently examining where the darkness got its start. What turns a challenging conversation into an enlightening encounter is holding up a mirror to see the traits you despise in others staring right back at you. What changes a crappy travel day into a transformative pilgrimage day is attention: taking the time to pay attention to what’s right in front of you and what’s deep within you. We go on pilgrimage to give ourselves the time and space to pay attention to life – life that’s all around us. Expectations just get in the way. As the experienced pilgrim, I was able to have some good conversations that week. I helped students name their expectations of what was supposed to happen so they could set them aside and focus on what was actually happening. I tried to point out the places where I saw God at work, in little and big ways. And I encouraged them to follow their hearts, take care of themselves, and recognize that transformation is deeply personal, physically draining work. And in the midst of guiding them, I relearned some things myself. My expectations of myself as a perfect leader get in the way of opportunities to be an authentic leader. My need to follow an itinerary can be stifling to the winds of the Spirit, who blows me in new directions when I finally let go. And my job as pilgrim leader is not to remake everyone’s experience in the image of my own. My job as pilgrim leader is to stand beside and walk with other pilgrims and enjoy the wild diversity of my companions. Who knows where the Holy One will lead us next? I have no expectations. Only hope. 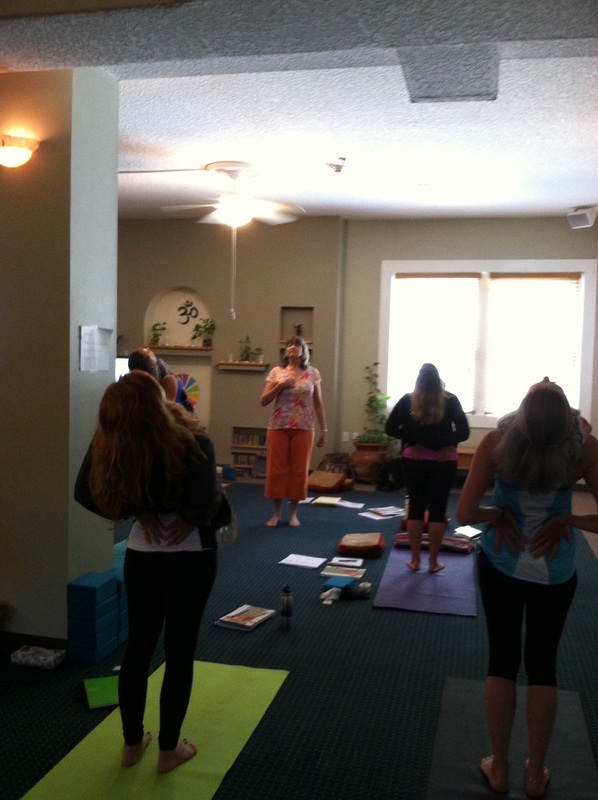 Last summer I spent 5 weeks living in St.Augustine, FL at Discovery Yoga’s teacher training program. I packed my Subaru Forrester to the hilt with bags of clothes, boxes of books, and a crate of dishes so I could make my own meals. I had my bike on the back of the car and my kayak crammed IN my car (less noisy than driving 2 days on I-10 with a kayak on top.) I lived in a small room on the bottom floor of the facility, with a bathroom and kitchenette around the corner. I had a full life that summer, studying yoga but also riding my bike downtown and kayaking the Intercostal Waterways. I didn’t read all the books I brought and I didn’t wear all the clothes I brought and I surprised myself with how little I needed. Just me and the Subaru, filled to overflowing. This summer I spent 5 weeks in Europe, leading a group of students to Scotland for the first two weeks, and then traveling solo to England and then France for the final weeks. I gave my students the ultimatum that we would all travel with just a carry-on suitcase and a backpack, knowing that traveling light = traveling happy. So I faced packing for 5 weeks and 2 climate zones with a little trepidation. Scotland was sure to be cold and rainy, so the waterproof boots, jacket, and pants had to be included. Southern France (Taizé!) was forecast to have temps in the upper 80’s. So capri pants and sleeveless shirts had to come, too. I was required to bring my own towel for Iona Abbey in Scotland, and my own sheets for the Taizé Community. Plus, this was the first time I’d traveled overseas with a gluten-free diet restriction, so I anxiously added about 25 protein bars to my suitcase. Each time I arrived at my destination, I discovered that living out of a carry-on was actually quite simple. Getting dressed was a breeze. The question wasn’t, “What classy outfit can I put together today?” The question was, “What clothes are clean today?” I didn’t have to think about what shoes to wear, either. If it was cold, the boots came out. If it was warm, the running shoes won. Every third day was laundry day – washing clothes in the sink actually works! And somehow air-drying in the French countryside added a fresh scent even to my much-worn socks! I didn’t do too much reading, but I did a lot of writing in my journal, processing all of the amazing experiences of my trip. Living out of a carry-on suitcase for 5 weeks, I had a simple life. I had a simple routine. I had what I needed. And yes, I had just enough protein bars! Now that I’m home, I’m finding the choices overwhelming. The first time I opened my closet door, I got dizzy. And those who know me understand that my closet is neat and tidy, organized by category and by the color spectrum (ROY G BIV!) But all the organization in the world couldn’t soothe my spirit that day. I’m back in my own kitchen, full of gluten-free options for breakfast, lunch, and dinner. But I’m mystified at how to put all the ingredients together to make a meal. I’ve been eating black beans and salsa for way too many meals now. And don’t get me started with all the projects facing me at work. I knew that I had a tendency to say “Yes!” to every interesting idea. But returning to my office to find 12 clipboards full of notes about upcoming ministries was more than a wake-up call. My life is more overstuffed than my carry-on was. So it’s time to get back to the essentials. What do I really need? Can I get rid of some of these clothes? And can I simplify my pantry? But more than anything, can I let go of some of my interests and projects at work? Along my journey, I let go of some things. A bag of gluten-free rolls that molded. A shirt that was uncomfortable got donated. Pamphlets from historical sites I’d visited had to be recycled. The one thing I was able to add along the way, without weighing down that carry-on, was relationships. A clergy couple and their teenagers from San Francisco, whose 5-week itinerary almost matched mine. A delightful Iona volunteer from Indiana, in the midst of discerning a call to the ministry. A spirited clergywoman from England, supervising the center at Iona and leading with compassion and class. A fellow pastor who, in the midst of planning a move from Scotland to the US, made time to join us for an evening of traditional Scottish dancing (a ceilidh!) An old friend from Iona, who welcomed me and nursed me back to health in Cambridge. A roommate at Taizé from Barcelona who bravely shared her story of loss and enabled me to recognize my own healing. A fellow college chaplain from the Netherlands who shared not only great ideas for connecting with students but also a listening ear. All of these relationships enriched my experience and strengthened my spirit as I journeyed. Looking back, I see how I hauled too much baggage across Europe. On that journey, and in everyday life, there are some things not worth carrying. One thing I’m learning: all I need, I carry in my heart. All my life, I’ve been told that Lutherans evangelize (share the Good News of Jesus) by setting a good example. Our lives are supposed to be so compelling that people will notice our peace and love and joy and simply flock to church to get some of that for themselves. In the 80’s, the ELCA launched a media campaign with photos of a variety of people in their work clothes with the tag line, “You may live next to a Lutheran and not even know it.” We were proud to be anonymous, perhaps as a reaction to the drama of TV evangelists at that time. But the plan continued. In 2002, as a newly ordained pastor, I ordered the latest evangelism DVD, planning to train my parishioners to share their faith more openly in the world. The video arrived, and as I previewed it, I discovered that the entire 15 minute show was void of talking. There was background music with images of Lutherans living their lives, anonymously doing good works, with no reference to how we talk to people about our experience of God’s love. Apparently, we doubled down on our silent evangelism plan. As I began my training as a yoga instructor, I fell into the same trap. I was comfortable on my yoga mat. I could even feel ok about putting that mat in front of a group and going through my own yoga routine for my class to watch. 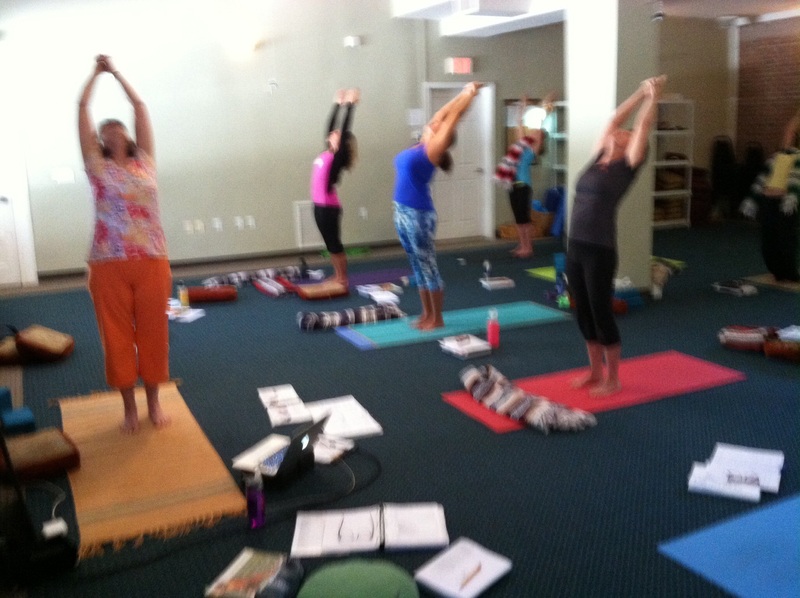 I felt safe on my own mat, experiencing the power and grace of my practice. 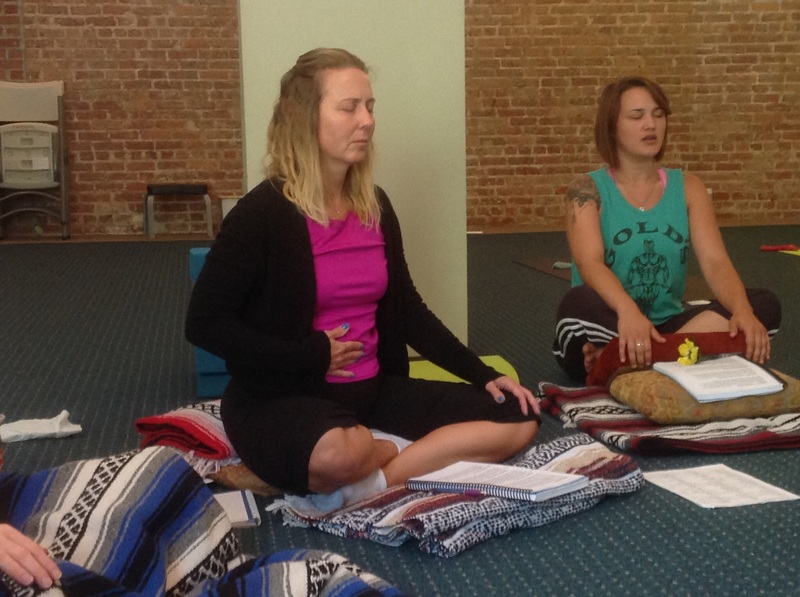 I was growing stronger and finding inner peace, but what about my students? When I finally looked up, I realized that several of them were floundering, unsure of what pose I was instructing, unclear about where to fold or stretch or twist. Clearly, I had some work to do. First, I worked on my language. I had the images of the poses in my mind and the feel of the poses in my body, but I didn’t have the words to convey to others. So I turned to my manual that listed all the steps needed for every pose. I read through the steps, not as a student, but as a teacher. How would I describe that move? Would I use that phrase or would I say it a little differently? As I worked through those decisions, I came up with my own version of the instructions. Then I wrote down my version. I recorded my version. I listened to my version. I began to internalize my own instructions, the description of how the poses work. But I still wasn’t fully ready to get off the mat. And after I had finally developed a close relationship with my students (my fellow teachers-in-training), I got to practice even deeper assists. I learned where to place my hands on my student and how to position my legs to protect my back so that I could give this amazing assist for fish pose that feels like a massage on the lower back. I was helping people, really helping where they needed it. 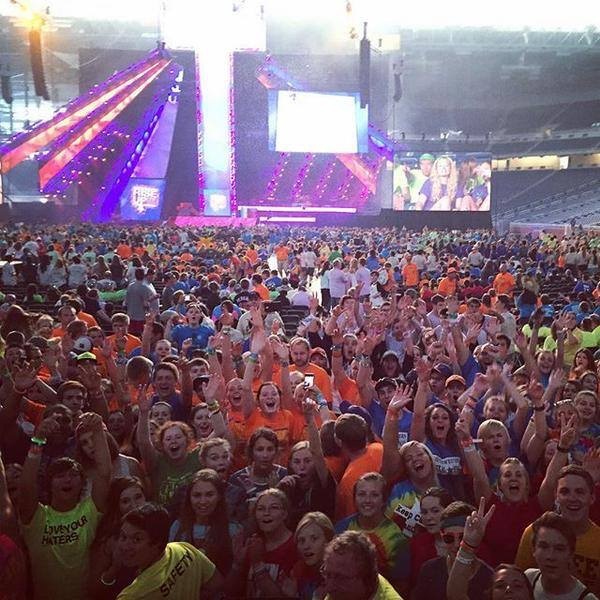 Today I’m at the airport after spending the weekend with 30,000 Lutherans in Detroit at the Youth Gathering. For the past three days in a row, groups of youth and adults have blanketed the city, cleaning up parks and planting flowers and boarding up abandoned houses with murals painted at the activity center. And the best part is that they were doing all of this alongside the neighborhoods’ residents. Moms and sons, uncles and grandparents, daughters and friends all turned out to partner with these kids in Skittle-colored T-shirts who came to show God’s love. For some of these Lutherans, traveling to inner-city Detroit to help strangers is a stretch. And for most of them, finding the words to share why they would come so far to do so much is terrifying. My hope and prayer is that along the way, they were able to find their own language, their own version of the gospel story, and share it with confidence and authenticity. Because it’s when we get off our mats and out among our neighbors that we truly discover the power of God alive within us, empowering us to share the story of Christ’s transforming love with the world. 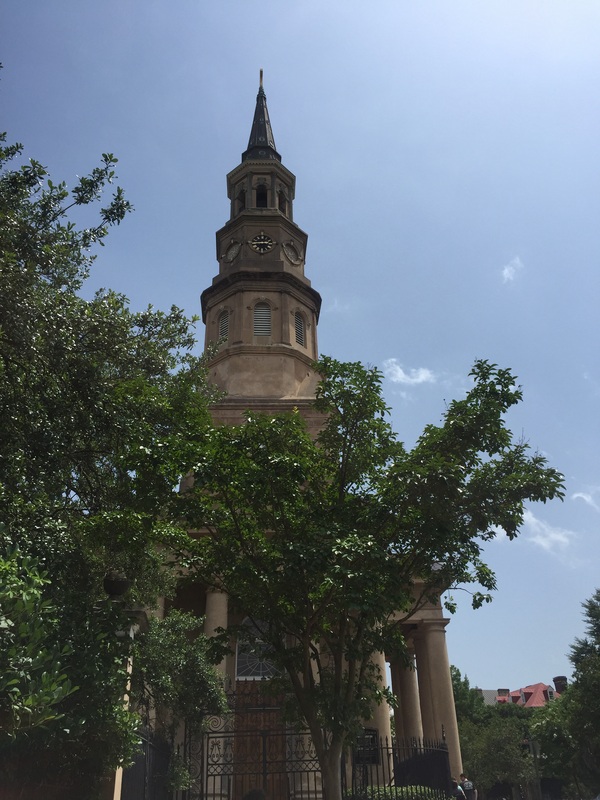 When I visit Charleston, it feels like coming home. I didn’t grow up there, but I did grow into myself there. My first church was Redeemer Lutheran in West Ashley (that’s across the Ashley River from the peninsula of Charleston) and my first home was in Belle Hall Plantation, across the Cooper River in Mt. Pleasant. I arrived as a young woman, fresh out of seminary, with big ideas and big dreams about making a difference in people’s lives. I worked late hours organizing youth events and outreach ministries and developing relationships with the young adults who were moving to the area just like me. It was a moment in time when I felt that everything was possible and that nothing could happen that I couldn’t handle. 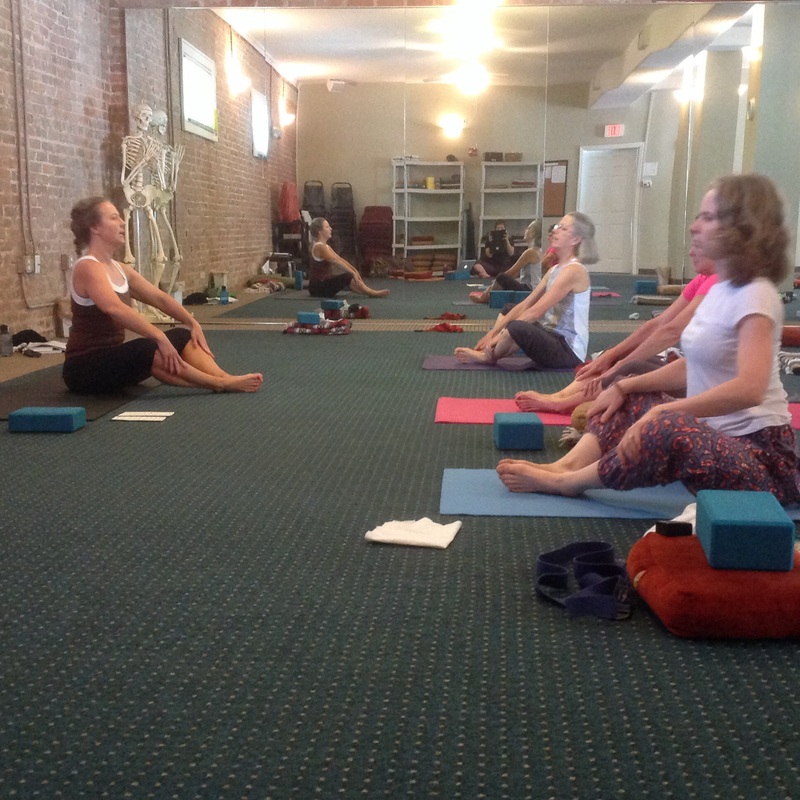 In the middle of yoga teacher training last week, I was invited to spend the holiday weekend in Charleston with our assistant director, Lisa, and another student, Linda. I was looking forward to the escape, leaving behind the stress of planning my practice classes (yes, yoga teacher training can be stressful!) 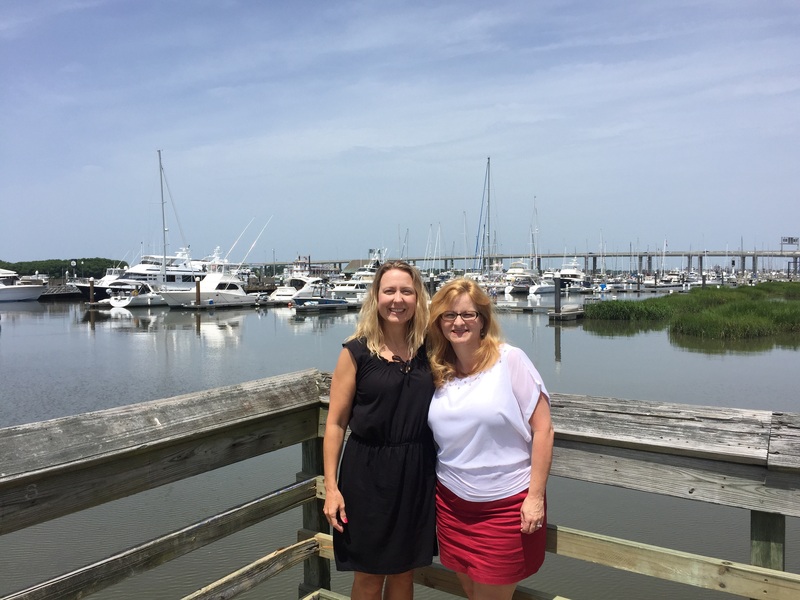 I couldn’t wait to share my Charleston with my new friend, Linda, who’d never been there before. I wanted to run the Cooper River Bridge again, remembering my favorite 10K road race. I wanted to show her the rivers that dominate the landscape, bringing life and energy to the city. And I wanted her to walk the streets and feel the sense of history and heritage that permeates every building and landmark. I wore myself out on our drive to downtown, pointing out the street where I used to live, the Coburg cow that changes color for the holidays, and the Krispy Kreme with the Hot Now sign that used to lure me in. 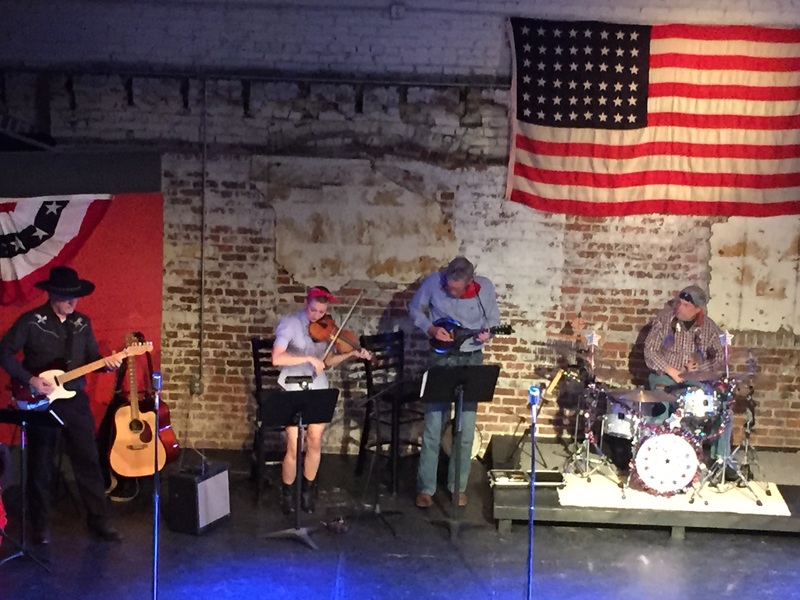 With a storm approaching, we didn’t get the full downtown tour, but we hit the highlights and prepared for an evening concert performance by Lisa’s fiddle-playing daughter. After the amazing show (don’t miss them at Woolfe Street Playhouse!) we walked down King Street for some ice cream. Expecting to be wary as we walked down an empty street at night in this part of town, I was confronted by crowds of young professionals, scantily-clad and all clambering to get into the new hot spots downtown. What happened to my Charleston? I used to enjoy walking the streets at night, along the quiet waterfront, past the peaceful churches and their semi-spooky graveyards. Now I was thrust into some kind of Kardashian-inspired catwalk, where being seen at the right club would make history on your Instagram. This is NOT my Charleston, I told Linda. I realized that my memories of life in Charleston were holding me back from experiencing the delight of Charleston today. And I thought about all the other memories that hold me back. Memories of old relationships that cloud my perception of new relationship possibilities. Memories of the way my body used to work that hold me back from enjoying the way my body works now. Memories of accomplishments and achievements that set impossibly high, perfectionist standards that get in the way of trying new things and taking risks. Yogic philosophy gave me a name for the feelings I was having that night, and reminded me that being in the present is the only way to pay attention to God’s presence within and around me. The more I’m looking over my shoulder at the past, and longing for whatever used to be, the less I’m able to see what’s right in front of me: the abundant graceful gifts of God. As I enter my last two weeks of yoga teacher training, I want to be fully in the present, taking on the challenge of being a beginner at this new thing, and embracing the blessings of the supportive community Discovery Yoga creates for their teachers. So it’s time to let go of the memories, file them away so they don’t take center stage, and allow the present to blossom in front of me, full of abundance and grace and the promise of new beginnings. Everything is hard here. Even breathing is hard. That look on my face- it says it all. The concentration. The introspection. The hard work. And all I’m doing is breathing. But it’s not just the new breathing techniques I’m learning, trying to understand their different effects on my body and imagining teaching others to breathe in these ways. It’s also the Sanskrit syllables that now float through my brain, unrelated to the poses I’m trying to memorize. And it’s the 8 Limbs of Yoga (principles,) 5 Yamas (social ethics,) and 7 Chakras (energy centers) I have to memorize by next week (and did I mention they’re all in Sanskrit, too?!) Plus, my body isn’t used to such a long yoga practice every day and I’m learning I have limitations in sometimes very public ways. Everything’s hard here. I entered the massive sanctuary which was already crowded with the people who knew to get there early. As a latecomer, 10 minutes before worship started, I was seated in the back section, underneath a gargantuan scaffolding erected for restoration of the interior. As I settled into the uncomfortable pew that had been keeping parishioners awake for generations, I noticed that the pastors, instead of wearing the typical Presbyterian black professor-type robes were wearing white albs and colored stoles, just like my own Lutheran tradition. I let out a little sigh – home. As the service continued, we prepared for the Gospel reading by singing, “Alleluia! Lord, to whom shall we go? You have the words of eternal life. Alleluia! Alleluia!” with the same tune I’ve been singing since I was young (that’s LBW setting 2, for all the Lutherans out there.) Again, I sighed – home. The service continued with a commissioning of church camp staff, reminding me of my summer spent with Lutheran Outdoor Ministries of Florida, and a sermon from the senior pastor that I would have preached myself. We closed with a verse of “Go, My Children, With My Blessing” which never fails to bring tears to my eyes, and I was filled. Filled with love of God, filled with gratitude for the music and worship, and filled with peace down to my center. I was home. On the way out, I connected with that fellow pre-schooler. In the midst of hundreds of worshippers, I happened to be sitting across from the one person I wanted to meet. Grace is funny like that. On the steps of this historic church, Pastor Amy and I shared memories of our teacher who came to the U.S. from Ceylon (Sri Lanka, south of India) and the incredible influence she’s had on our lives. I reflected on how strange it was that two Protestant pastors would name a Buddhist teacher as a formative figure. And that’s when I felt it. I began to sense something stirring within me, drawing me outside myself again. The Spirit was compassionate in nourishing me with a worship service that touched my soul, but was not content to leave me there. I was being called back into the world, back into the newness, back into the challenge. It may be that I still have lessons to learn (and definitely more Sanskrit to memorize!) It may be that I am called to share what I’ve already learned with others. And it may well be that the true purpose of this outward movement won’t be revealed right away. But one thing I know: I am called to leave the comfort of my pew and get out and explore the world and the people and creatures who live there, so that together, we can create a new tomorrow, full of grace and hope and love. One week ago, I was a bundle of nerves. 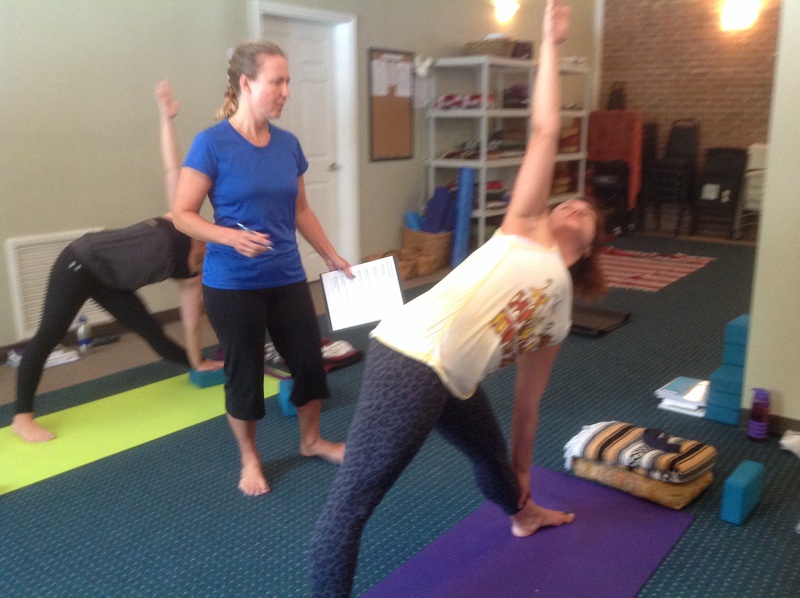 I was preparing for my trip to Discovery Yoga in St. Augustine, FL for a 5-week class on teaching yoga, and I was paralyzed by my anxiety. What should I pack? Do I need another pair of shoes? What if I can’t keep up with the anatomy lessons? Is there a tutor for people who are allergic to science? I’m not very advanced in yoga – what if I’m the worst one in the class and everyone laughs at me? I have what I need. I may not have a wide selection of yoga clothes, and I may wish I had brought more silverware so I didn’t have to wash my dishes after every meal. But I have a comfortable bed to sleep in, a grocery store close enough to bike to, and a community with resources to share. What I need for each day continues to be provided. I will learn what I need to learn. I will probably have to study my anatomy book more than my philosophy book. I may struggle with the foreign language terms and feel childish as I give instructions for a pose I’m not an expert at. But I am certain the learning will come, because I feel it already blossoming within me. Yoga is not a competition – with anyone else or even with yourself. What my body needs to do today, I will honor. Where my edge in the stretch is today may be different from yesterday. Pushing past that edge only leads to pain, and, to quote one of my teachers, “Yoga is supposed to be about ahh, not ow!” My physical ability is only part of what I bring to my yoga practice. I’m on a journey into new territory, learning a new skill, learning a new way of seeing the world. 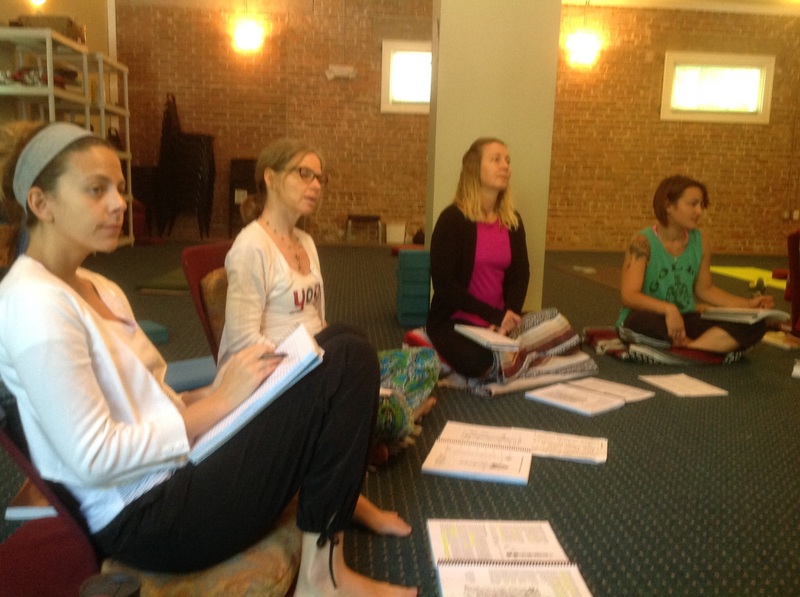 But beyond that, I sense the deeper purpose of that grace that led me to choose this yoga teacher training program. What I’m here to learn is a new way of seeing myself: strong and weak, powerful and vulnerable, searching and found. And though I may only be a few days into the process, the glimpse I’ve had of that vision is glorious.